Microflex and High Five are premier suppliers of disposable gloves to dealers and distributors worldwide serving the healthcare, laboratory, safety, industrial and food markets. They have earned reputations as premium brands known for exceptional quality, consistency and innovation. Disposable gloves protect the hands from all types of hazards — chemicals, particulates, biologicals and other contaminants. 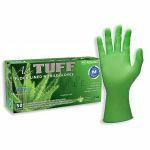 Microflex and High Five offer full lines of disposable gloves in a variety of colors, styles and materials including latex, nitrile, vinyl and chloroprene. The materials these products are made of each has its own benefits of use and can impact a worker's ability to perform their job tasks. Microflex® Ultraform® Powder-Free Nitrile Examination Gloves. They forms to your hand effortlessly as if it is second skin. 100% natural Aloe Vera that undergoes a stringent purification and decolorizing process. Proprietary MilTek™ polymer technology delivers more uniform thickness providing unmatched tactile sensitivity at the fingers, high durability at the palm and cuff. 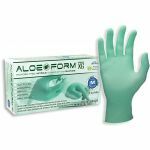 Non-latex chloroprene offers superior abrasion and puncture resistance and the fully textured grip allows better handling of small parts and slippery objects.